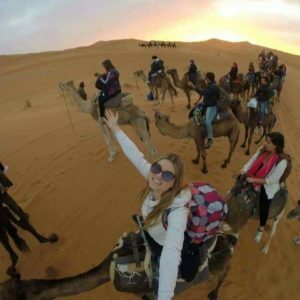 All of our camel trekking tours develop a complete nomadic way of life experience. This includes: a nice camel ride through the desert dunes, a welcome mint-tea after the sunset, a local dinner under the stars, sleeping in a Berber tent or luxury tent and, of course, the magical and unforgettable sunset and sunrise over the Erg Chebbi dunes. 1 night in Desert Camp Merzouga by Camel ride. This is our most popular tour. The trip begins in the afternoon. It starts with a camel ride from a hotel near the sand dunes. The camels are packed with food, blankets and everything what we will need. The trek starts right into the desert with one hour and a half camel ride, till we reach the camp. Be ready for the best sunset ever in the high dunes! After the welcome tea, you will be able to enjoy the stars and the shiny moon, in the darkest and clearest night you can see. We taste some local food for dinner and talk with local people in the full equipped camp, with drums music and great environment in the middle of the Sahara. We sleep in traditional nomad tents till the early morning, the sunrise. We get up early to see an incredible sunrise, again from the high dunes. In the morning we ride the camels back to Merzouga, where we have a traditional breakfast and a good shower in the hotel in Merzouga. Price: Depends on number of persons. 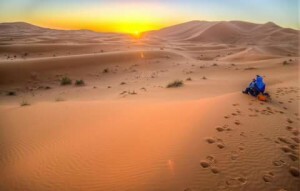 + A room in the hotel where we organize our desert trips to leave some of your luggage and take a shower. + Parking for your car (if you need). 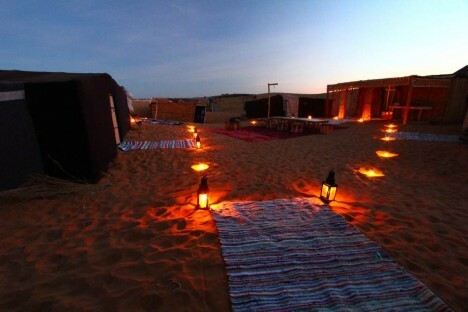 + Nomad tents (Desert camp). + Dinner in the desert and breakfast in the hotel. + A camel for each person. + Bottle of water each. 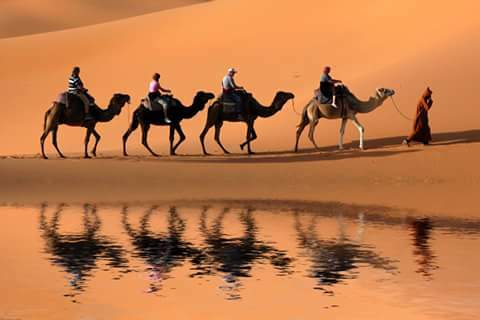 1 night and half by camel ride in the desert of Erg Chebbi Merzouga. This excursion starts in the morning around 10:00. 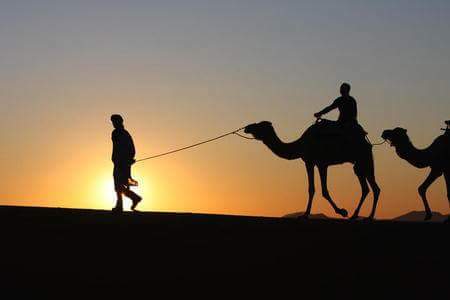 After one hour and half of riding a camel or walking, you will reach the one family village; and old village with real Berber architecture, where live only one nomadic family. We will discover and explore this historical area and see how they live and deal with their daily life. After that we are going to visit Berber small houses and tents, and stay with them for a break to drink tea and share with them the experience and we could have lunch there (BERBER PIZZA). 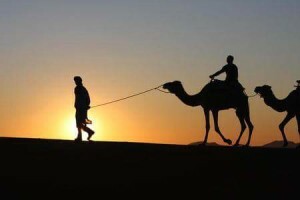 And then we hike or ride the camels to the camp to present for the great scenery, of the sunset over the sand dunes. After we have a tasty dinner, drums music, jokes and hiking in dunes under shining stars. In the morning we have breakfast then comeback to the hotel to take shower and relax. Price : Depends on number of persons. + A room in the hotel where we orgnise our desert trips to leave some of your luggag and to take shower. + Nomad tents (Deser camp). + Lunch, Dinner and breakfast. + Camel and bottle of water each one. This trip, as the previous ones, begins in the afternoon. It starts with a camel ride from a hotel near the sand dunes. The camels are packed with food, blankets and everything what we will need. The trek start right into the desert with one hour and a half camel ride, till we reach the camp. Be ready for the best sunset ever in the high dunes! + Sandboarding in the dunes. The Sunrise Tour starts in the early morning. It takes around half an hour to reach the big sand dunes of Erg Chebbi by camel ride. We leave the camels to reach the highest dune of Merzouga. This tour includes a visit to the garden on the way back, where you will have a nice explanation about the canal system. For this tour you don’t need to set the alarm clock. Enjoy your night and we will come around for a wake-up call.